As of the close of Friday’s market, the S&P 500 was down 2.6 percent year to date, and 8.3 percent since the market high on January 26th. The S&P 500 is still up 10.7 percent in the last twelve months, and the recent decline only brings the stock market back to where it was last December, after what appears to be excessive exuberance over the tax cuts. While this type of market decline (or correction) does not feel good to investors, it is not entirely a surprise. If you are a reader of our IMPACT newsletter or blog, you may recall our observation of the near record length of this stock market expansion and our curiosity over the market’s confidence in the president’s economic agenda. While these factors have been noteworthy and have highlighted potential risks, the strength and growth rate of corporate earnings have provided a rational for some of the ongoing positive market returns. Events of the last two months have ended the record length of the bull market. It appears the market has joined us in questioning the economic implications of the president’s agenda. At the time of this writing, corporate earnings and expectations of earnings growth remain strong. 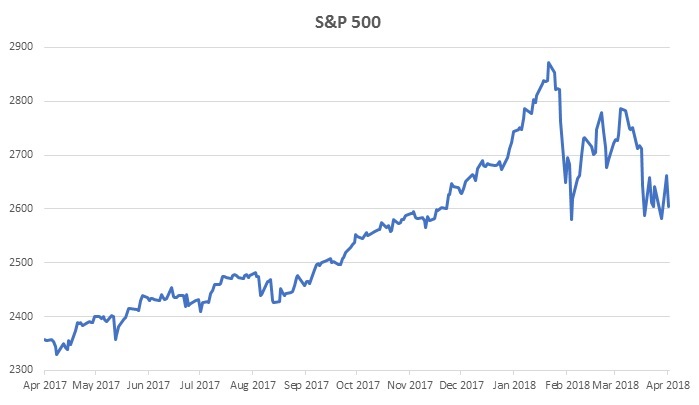 While many of us enjoyed stock market prices that were considerably higher, we believe the current prices are a better reflection of both the risks and opportunities of the stock market in this stage of the economic cycle. Stay tuned to our newsletter and blog for more analysis, and please contact us if you want to learn more about the Veris approach to wealth management. If you want to subscribe to the Veris IMPACT newsletter to keep up to date with our market commentaries and perspective, please sign up at https://www.veriswp.com/contact/.